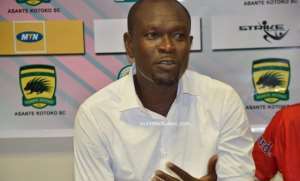 Former coach of Asante Kotoko, Malik Jabril has called on the management of the club to maintain CK Akonnor as their head coach despite their elimination from the CAF Confederation Cup. The Porcupine Warriors were eliminated from the group stage of the CAF Confederations Cup after 2:1 defeat to Zesco United at Levy Mwanawasa Stadium in Ndola on Sunday. But, according to Jabril, the management of the club should stay behind the coach because he has passed the test given him despite the limited time to had to prepare the team for the African Campaign. "Sacking the Coach won't be the solution to the problems in the team but we must prepare and build a formidable team for the future"
"There was no understanding within the Defence so, the Management and the Technical Team should tackle the Defensive problems because it caused the team from the start of the Competition." "They also need to reinforce the attacking department within the team and also strengthen the midfield to make the team very strong in future."